Recipe Roundup is a biweekly post where we share our favorite recipes that include a tea ingredient. We share recipes every 1st and 3rd Wednesday of the month. Ready for a chai-tastic French toast? We are! Okay, even thinking about this recipe makes us salivate. What better way to start off any holiday morning than with Chai French Toast Skewers by Lauren Grier? Not only is it absolutely scrumptious, the only “special” ingredient you’ll need is brewed chai tea, and we just so happen to carry an amazing line of Australian Chai from Prana Chai. Another awesome note about this recipe? It can be made ahead of time! We can’t think of anything that encompasses the holidays more than this! Read on for the recipe. In a large bowl whisk together the eggs, buttermilk, whole milk, kosher salt, vanilla extract and chai tea. In another small bowl combine the sugar, cinnamon, cardamom, ginger, cloves and pepper. Lay the bread slices on a baking sheet. Dust the tops and bottoms of each slice with some of the cinnamon sugar mixture. Go as heavy or as light as you want! Next, cut each slice into four 1-inch cubes. Preheat a large skillet to medium heat. Melt 1 tablespoon of butter on the pan. In batches, lightly dredge the bread cubes through the chai milk mixture making sure to shake off any excess batter. Cook the bread cubes on both sides until golden brown, or for about 4 to 5 minutes. Repeat the process until all the bread cubes have been cooked. Next, take a skewer and thread on 4 to 5 bread cubes. Place the skewer on a plate. Repeat the process until all the skewers have been assembled. 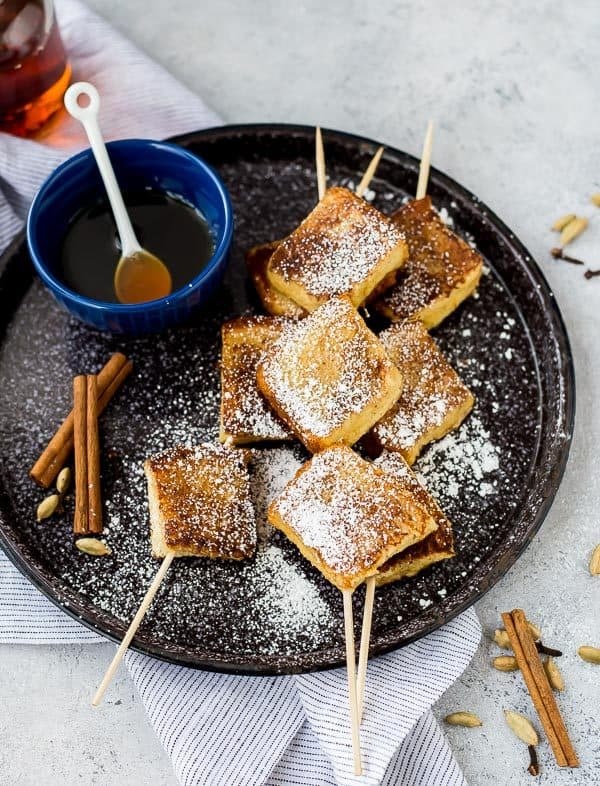 Serve the Chai French Toast Skewers with powdered sugar and maple syrup. Note: These skewers can be assembled and made ahead of time. To reheat, simple preheat your oven to 375°F and line a baking sheet with foil. Spray the foil with nonstick cooking spray and place the skewers on the baking sheet. Place the baking sheet into the oven for about 5 to 7 minutes or until heated through. Have you made this recipe? Share your experience with us in the comments!